And when I say simple, I mean super simple! Also, when I say negative energies, what I actually refer to is: any feelings of stress, anxiety, exhaustion, fear, insecurity, and you’re free to add here any other unpleasant emotion that’s bothering you at the moment. In truth, there is no good and bad, positive and negative. The discussion on duality and separation is long, and I intend to write a few things on the subject in another article. Emotions are just emotions, and things are just things. They come up to show us something, and for now, let’s see how we can better deal with those emotions that feel icky. Now, I love a long, relaxing, scented bath myself. 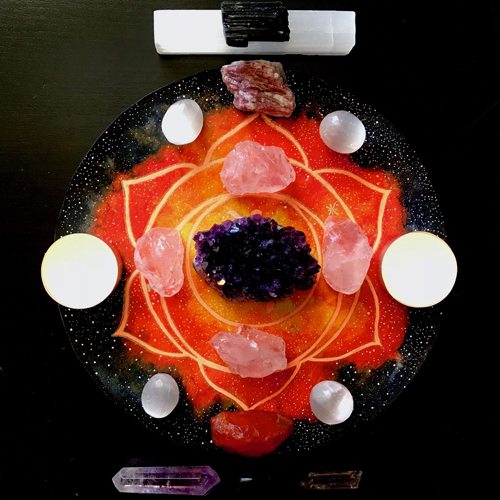 The sort of bath where you add salt, bubbles, rose petals, essential oils, crystals, all kinds of herbs, and you burn sage, light candles, rub honey all over your body, and re-balance your chakras with a selenite wand. However, I think you might agree with me that when you’re exhausted after a long day that was definitely not good for science, the last thing you want to do is run around the house and go through your pantry to find things to throw in your bathtub. If you have everything already prepared in cute jars, awesome! But what do you do when you don’t? Here’s what I do: I grab my Dead Sea salt (you can use any type of bath salt you prefer) and a black tourmaline crystal, and I run my bath. That’s it. I don’t need more than salt, black tourmaline, hot water (not too hot, though), and the power of my own intent. If I feel anger, then what made me angry? I identify the situation or the person. If I feel anxiety, then what am I anxious about? If I feel stressed, then what are the exact things that caused the stress? And so on, until I have most of it figured out. I say most of it, because it often happens that we feel bad, but we don’t know why. That’s fine. This simple ritual will still work. Next, I identify where all these things seem to be stored in my body. My anxiety is usually in my stomach, for instance. Stress might be around my temples. Everyone is different and feels emotions differently, so work with your own intuition here. Once I do this, I grab my black tourmaline, hold it against my lips, and visualize the emotions I want to release as these thin, black or gray waves that I can move through my body until I bring them to my mouth, so I can blow them into the crystal. Please note that what you’re doing now is not programming your crystal in any way. You’re just releasing all that you don’t want or need anymore and allow the black tourmaline to take those feelings and worries from you. Later, you will cleanse it via your preferred method. That’s it. Do this for a couple of minutes, until you feel light and clean. When you’re done with your bath, know that the salty water is taking all the unpleasant stuff with it, down the drain.